Oh, the fun I must be missing by not caring to skim through my system logs. 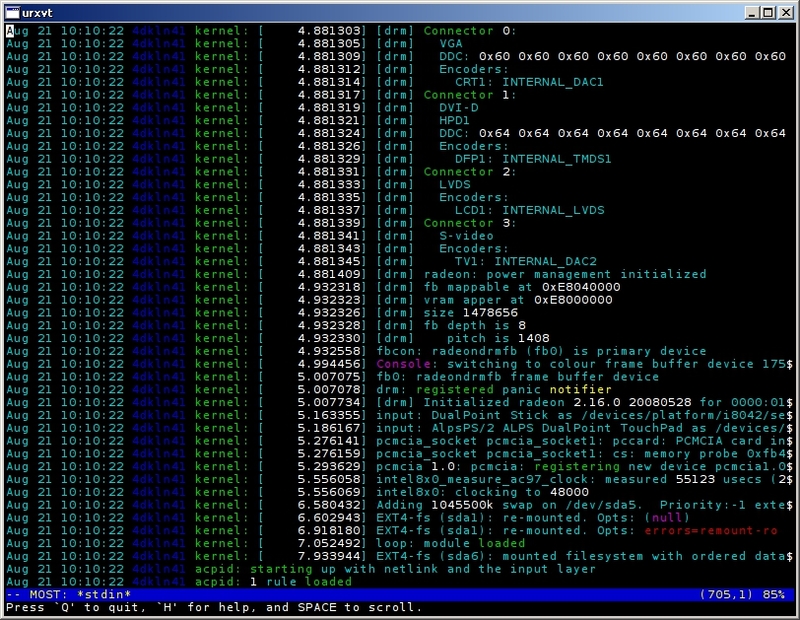 That’s ccze, and by comparison with some other log utilities, it’s a bit simplistic. Believe it or not. That’s the Debian version you see there, skimming through the system logs. Arch has a version in community, which seems to work the same. ccze has apparently been around a long time; the Freecode page shows the latest update in 2003. If it has an official home page, somebody ought to tell both the Arch and Debian maintainers. The Arch page leads to the Freecode page above, and the Freecode page thinks the website is the Debian package search. Things like that amuse me. For what it’s worth — which isn’t much — I prefer lnav or multitail over ccze. My best success with ccze was to pipe a log through it, and then I got the color effects. But ccze itself isn’t a pager, which means you either trim back on the log with head or tail, or use less or more, like you see above. That’s a bit high maintenance for me, particularly when lnav seems so featureful. And multitail is so much fun to use. On the other hand, it does work like a colorizing filter. So maybe that’s the Unix solution. You can decide. This entry was posted in Linux and tagged information, log, system on 2013/09/19 by K.Mandla. Remove the “\” escape chars if you want to test it in the terminal.